25 years ago, on the 18th of May 1988, the ground-breaking ceremony was carried out to begin construction of Tegchen Legshey Ling, which is Karma Thinley Rinpoche’s monastic seat (Tib: gompa) located close to the great stupa of Jarung Kasyor in Boudhanath, Kathmandu, Nepal. This year, on the 18th of May 2013, a celebration was held to commemorate the 25th anniversary of the beginnings of the monastery and to make wishes and prayers for its continuing activity and prosperity. The day began with the monks and nuns of Tegchen Legshey Ling performing a special ‘tsang’ ritual, which is for removal of obstacles as well as for auspiciousness. This was accompanied by a long-life ‘tsedrup’ ritual and tsok from the terma cycle of Ratna Lingpa, carried out for the continuing good health and long life of Karma Thinley Rinpoche, and that all sentient beings might be free from the sufferings and obstacles brought about by poor health and short life. At the same time a large banner covered in many images of the long-life deity White Tara was attached across the front of the main building of the gompa, and a splendid Kagyupa flag erected on the roof. These ceremonies were followed by a festive lunch, held at the grand old Yak & Yeti Hotel, one of the largest in Kathmandu. The lunch was attended by Karma Thinley Rinpoche himself, Tulku Khedrup Gyamtso, Zopa Tulku, Lama Kalsang Gyamtso and all the sangha together with many lay friends of the gompa. The 16th Gyalwa Karmapa, Rigpa’i Dorje, recognized Rinpoche as the 4th incarnation of Karma Thinley, and Rinpoche says it is through the Karmapa’s blessings that he has been able to carry out some Karmapa Dharma activity (Rinpoche’s name Karma Thinley means “Karmapa Dharma Activity”). Soon after arriving in India Rinpoche first established a gompa in Tilokpur, India, and later went on to establish Dharma centres in New Zealand, Canada and England. As well as Tegchen Legshey Ling in Nepal, Rinpoche has also built Tegchen Choskor Ling gompa in his home country of Nangchen, Kham. Over the last 25 years, Tegchen Legshey Ling has been of great benefit to many diverse groups, including those people from Nangchen living either in Nepal, in India, still in Nangchen, and even those now spread throughout the world. 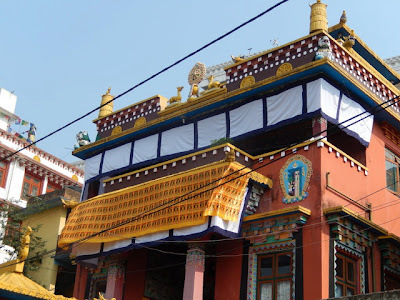 Local Nepali Buddhists have also been able to make considerable use of the gompa, as have the sangha of the Dechen centres under the direction of Lama Jampa Thaye. Over the years the gompa has developed a good reputation, and receives many requests for prayers and rituals. Rinpoche’s uncle, the nobleman Namkai Dorje was able to shift to the gompa from India, and spent the last years of his life in residence here. He was a guiding influence at the gompa and also taught the sangha the special lineage he carried of the severance practice called ‘chod’ that he had received from his famous yogi uncle Jamyang Temphel. This ‘chod’ is practiced every afternoon at Tegchen Legshey Ling following the Kagyu Mahakala ritual. 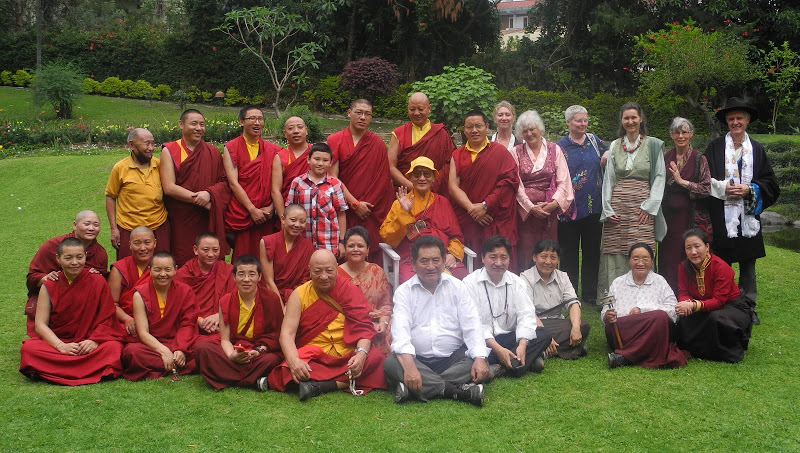 Karma Thinley Rinpoche and all the sangha of Tegchen Legshey Ling would like to extend their gratitude to all those sponsors, donors and supporters who helped establish the gompa and who have been involved in helping to maintain and develop the gompa further. Creating and maintaining Tegchen Legshey Ling as a repository for the three jewels, and as a manifestation of Karma Thinley Rinpoche’s activities and wishes, is a great wonder and source of enormous merit, being such an important contribution to the continuance of living Buddhism in the world today. With your continuing support and prayers for the continuing furtherance of Tegchen Legshey Ling, here in the holy land of Lord Buddha’s birth, Nepal, may the lives of our precious teachers remain stable; may the Holy Dharma be maintained and spread; and may the revered ordained sangha be upheld and supported. Lama Jampa recently spent two days at Ewam Choden in Berkeley, near San Francisco, at the invitation of Lama Kunga Rinpoche. 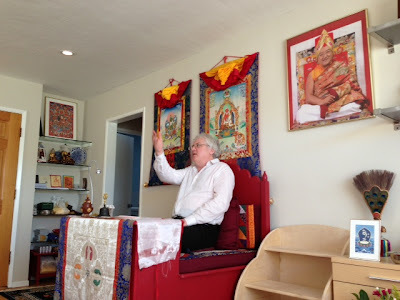 Lama Jampa gave teachings on both the Rime approach to dharma and the philosophical systems of Rangtong and Zhentong Madhyamaka. The teachings were very well attended and there was much opportunity for questions. Lama Kunga Rinpoche, who founded Ewam Choden in the early 1970s was the younger brother of Thartse Khen Rinpoche. 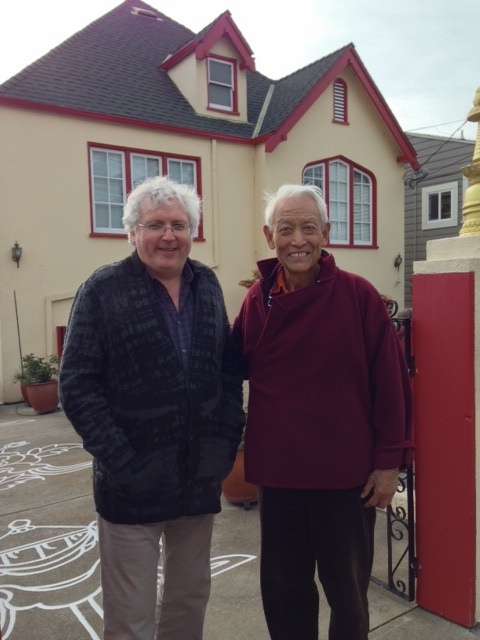 Lama Jampa received several key Lamdre teachings in the 1980s from Thartse Khen Rinpoche when he visited the UK. Lama Jampa is currently completing his tour of North America with a week of teaching at Sakya Dolma Ling in Mexico City. His next teaching in the UK will be at Sakya Centre in Bristol on May 11. Click here for details. Lama Jampa has just completed his bi-annual teaching programme in West Los Angeles CA. 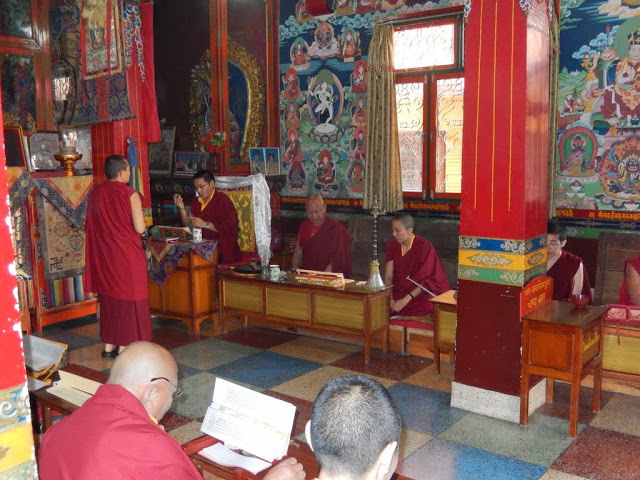 During his visit he gave a series of teachings at Yeshe Nyingpo, Kagyu Donak Choling and Sakya Samten Ling. On Saturday October 27 Lama Jampa taught a presentation of the Four Dharmas of Gampopa at Yeshe Nyingpo. At Kagyu Donak Choling on Wednesday October 31 he transmitted Chogyur Dechen Lingpa's Liberation through Hearing in the Intermediate State. Both these events were very well attended and provided an opportunity for the wider Buddhist sangha in Los Angeles to hear Lama Jampa's teachings. 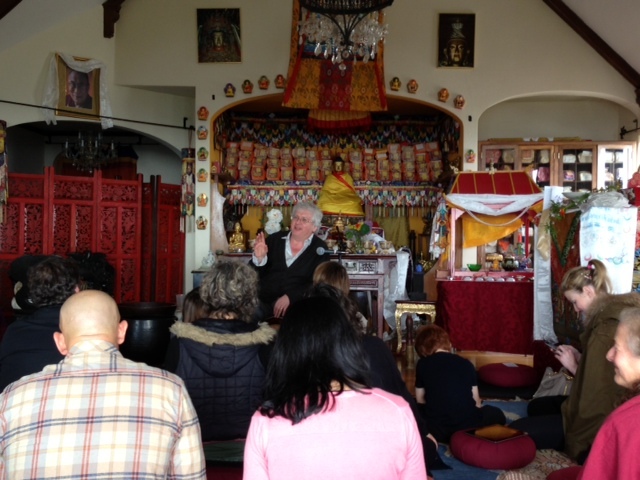 Lama Jampa gave two days of teachings at the Dechen centre, Sakya Samten Ling. On Sunday October 28 he gave a detailed exposition of Instructions to the Emperor. This work was composed by the renowned Sakyapa master Chogyal Phakpa for his illustrious disciple, Kublai Khan. On Saturday November 3 Lama Jampa bestowed both the initiation of Vasudhara from the lineage of Bari Lotsawa and also gave Jamyang Kongtrul's gomlung, a detailed explanation of Tangtong Gyalpo's Chenrezik practice, The Benefit of Beings that Pervades Space. Lama Jampa will return to California in March 2013. His next teaching event in the US will be at Tibet House in New York on Wednesday December 19 when he will give a presentation on the Madhyamaka (Middle Way view) philosophical systems of Rangtong and Zhentong. Click here for details.